Heavy duty and professional design. Universally suitable to lift and move away all common sizes of covers. High break-out force up to1500 kg. Device can be taken to pieces within seconds in order to be stowed in a car boot. Max Wheel Span: 1050mm (41in). Heavy duty professional device. Universally suitable to lift and move away all common sizes of covers. Can be taken to pieces within seconds in order to be stowed in a car boot. 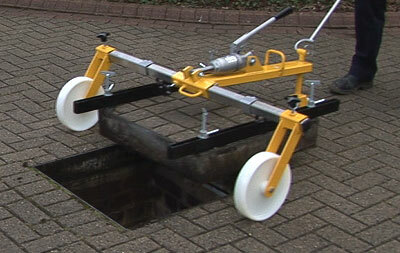 Do you require manhole keys? Just click the buttons below.